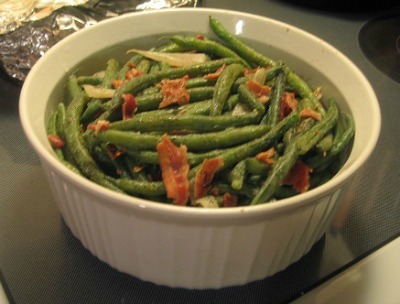 This outstanding and delicious Forget The Diet Green Beans Recipe is one of those special recipes where ingredients like bacon fat just cannot be substituted. The men of your family will go wild over this green bean recipe. * Green beans are available year round, with a peak season of May to October. Green beans are also called string beans and snap beans. Today's green beans have no strings. *** You can substituted other nuts of your choice. Leave green beans whole or cut into 1-inch pieces (your choice). In a large saucepan over medium-high heat, bring 3 quarts of water to a boil. Add green beans and cook, uncovered, approximately 10 to 15 minutes or until the green beans are crisp-tender (taste one to see if it is cook properly; the beans should still be very crunchy). Remove from heat, drain off the liquid, and rinse the beans under cold water to stop the cooking process. Set aside. In the same saucepan over medium-high heat, cook the bacon until crisp. Remove bacon and crumble; reserve bacon drippings in the pan. Stir the sugar and cider vinegar into the bacon drippings. In an ungreased 1 1/2-quart casserole dish, layer 1/2 of the cooked green beans, 1/2 of the crumbled bacon, and 1/2 of the almonds. Repeat layering. Pour the prepared bacon drippings over the top of the beans. Baked approximately 35 to 45 minutes or until thoroughly heated. 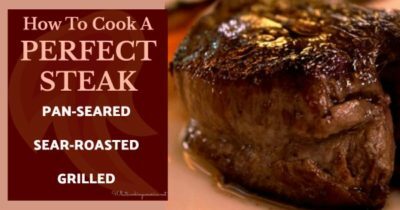 Remove from oven and serve. This tasty veggie combination features trademark ingredients of Province, France. Can be served as either a salad or a side dish with your meal. This is a colorful and full–flavored side dish. The combinations of purple and green beans are interesting. Take note – however that the purple beans turn green after cooking.